We’d love your help. Let us know what’s wrong with this preview of Ecopsychology by Theodore Roszak. This pathfinding collection has become a seminal text for the burgeoning ecopsychology movement, which has brought key new insights to environmentalism and revolutionized modern psychology. Its writers show how the health of the planet is inextricably linked to the psychological health of humanity, individually and collectively. 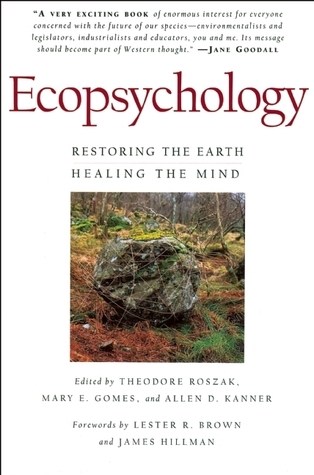 Contributors to this volume include the prem This pathfinding collection has become a seminal text for the burgeoning ecopsychology movement, which has brought key new insights to environmentalism and revolutionized modern psychology. Its writers show how the health of the planet is inextricably linked to the psychological health of humanity, individually and collectively. Contributors to this volume include the premier psychotherapists, thinkers, and eco-activists working in this field. James Hillman, the world-renowned Jungian analyst, identifies as the “one core issue for all psychology” the nature and limits of human identity, and relates this to the condition of the planet. Earth Island Institute head Carl Anthony argues for “a genuinely multicultural self and a global civil society without racism” as fundamental to human and earthly well-being. And Buddhist writer and therapist Joanna Macy speaks of the need to open up our feelings for our threatened planet as an antidote to environmental despair. To ask other readers questions about Ecopsychology, please sign up. I first got this book in college when I was writing my honors thesis for my environmental studies certificate and English degree. I believe it's out of print now. I decided to re-read it because I'm interested in studying this more in depth now. The book is composed of many essays that deal with the psychological component of the environmental movement, including how our physical distance from the natural world and knowledge of its destruction affects our psyche. Not the most entertaining read, as I first got this book in college when I was writing my honors thesis for my environmental studies certificate and English degree. I believe it's out of print now. I decided to re-read it because I'm interested in studying this more in depth now. This book gives insight into the psychological relationship between humans and the earth. It's essential for one to understand their relationship with the world and animals around them and to recognize the connections between all them. One cannot live without the other. An excellent compilation of forward thinking observations. "The time has come to move beyond the wildly held belief that psychological health is solely a function of individual wholeness and nurturing human relationships. Although this view has obvious therapeutic usefulness, it exists within a framework that perpetuates the separation of person from world and that denies the essential importance of an individuals surroundings." The An excellent compilation of forward thinking observations. ben took a class at MIAD that encompassed the ideas in this book. we've had this book since he took that class...i loved it then, and i have sort of "re" discovered lately. i think this book is what drove ben and i to apprentice on an organic farm after graduation of college.....feeling somewhat detatched from the cycles of nature. Four or five of the essays were fascinating but overall I can't really recommend this book. It doesn't even answer the basic question, What is ecopsychology? Apparently there is no single answer to that seemingly simple question. Every essay had a gem buried in it. And, where are the Ecopsychology training programs in this country??? Jeanette Armostrong (Okanagan elder) wrote the last essay and every word spoke to my heart -- what an amazing woman! Ecopsychology, environmental psychology, environmental sociology, conservation psychology - Jesus. It's all documentation of this rare drama onfolding around us now. namely, how we live and how we die. it's just happening faster than we ever thought. I read this for a class in undergrad. I was completely stunned with my emotional reaction to the information in this book. It is a must-read for people that care about the environment. Straight up: waste no time, as every page must be understood if we are to change our culture for the better! LOVED the Eco-centric insight of a variety of academics. Read it! A fascinating read! A wonderful smorgasbord of writings by a variety of authors on an exciting topic I wasn't aware had been around for awhile. Am keen to explore this field more. This book is what my heart's been trying to tell me since I was born. My textbook from the Ecopsychology course at Naropa. I am forcing myself to finish this book. i don't like it at all, but figured it would be a good read, yeah not so much. Theodore Roszak was Professor Emeritus of history at California State University, East Bay. He is best known for his 1969 text, The Making of a Counter Culture. Roszak first came to public prominence in 1969, with the publication of his The Making of a Counter Culture which chronicled and gave explanation to the European and North American counterculture of the 1960s. He is generally credited wi Theodore Roszak was Professor Emeritus of history at California State University, East Bay. He is best known for his 1969 text, The Making of a Counter Culture. Roszak first came to public prominence in 1969, with the publication of his The Making of a Counter Culture which chronicled and gave explanation to the European and North American counterculture of the 1960s. He is generally credited with the first use of the term "counterculture".